Lil Ho - Garden Tillers & Soil Cultivators - Light Weight Rototiller and Mini Cultivator by Hoffco/Comet Industries Inc. 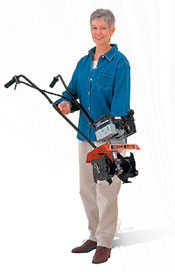 Since 1986, Hoffco’s Li'l Hoe garden tiller has been tops in its class of tillers. Rated #1 by two leading consumer magazines, the Li’l Hoe is rugged enough to go where many mini cultivators can't. Created with the garden in mind, the Li'l Hoe can easily be adapted to a multi-purpose lawn AND garden machine! And switching to various attachments requires no tools! Optional tiller attachments include a Lawn Aerator, Garden Border and Edger, Lawn Dethatcher, a Deluxe Wheel Kit and Digging Tiller Tines. For a complete package of literature, please fill out the form below and a representative will contact you soon. Easy to store and transport! The handles fold up, and can be used to hang in any storage area. Lightweight design makes it easy to transport and use! No reviews were found for Lil Ho - Light Weight Rototiller and Mini Cultivator. Be the first to review!